Everyone knew that Ralph Neufeld was a careful young chemist, especially his professor, Lou Brade. That’s why Ralph’s accidental demise due to a confusion of chemicals struck Brade, as well as the police, as highly unlikely. Someone on campus had, somehow, switched bottles on poor Neufeld, and the result was as deadly as had been planned. The trouble was all the right suspects were in the wrong places when it happened…all the wrong suspects had the right motives…and the one person most qualified to solve the crime was already being considered the killer! 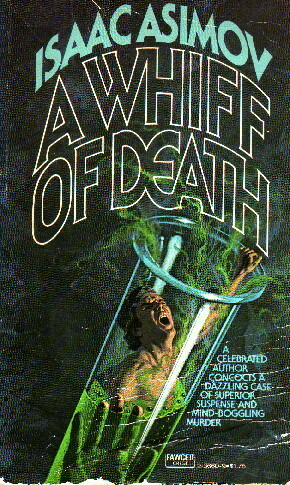 This is the first of Asimov’s two straight mystery novels and his first published non-sf mystery. Of course, despite that, the book has a strong tinge of science taking place as it does in a university’s chemistry department. As with his later (and inferior) Murder at the ABA, Asimov here is drawing on his own experience. The setting was familiar to Asimov as were the characters, often drawn on real people whom he had known. Some readers with professional association with Asimov had a great deal of fun trying to guess whom Asimov had written into the book. Chief among these is Asimov himself, who appears thinly disguised in two forms: one as the hero, Professor Brade, and one as one of Brade’s rival, Professor Foster. Brade is a picture of Asimov as he might have been, more exactly, in his fight with Boston University over promotion and tenure, the main difference being that Asimov felt none of Brade’s fundamental insecurity—Asimov had, as he put it, “outside income,” and so could afford to fight, whereas Brade cannot. Foster is Asimov as he dealt with others—loud, obnoxious, flirtatious. Even one of the central points of the novel—the faking of data—is drawn from Asimov’s own chagrin at discovering that he had needlessly reported to his Ph.D. advisor every stupid mistake he made in the course of his dissertation work rather than cleverly covering up for himself the way most people would. As for the novel itself, I’m not a big mystery buff (unlike Asimov) and so tend to be disinclined towards the book. Still, it’s not bad. Some of the characters are memorable, notably Cap Anson, and Ralph Neufeld (the victim). The detective in the book, Doheny, has pre-echos of Peter Falk’s Columbo (which Asimov enjoyed when he came on the air fifteen years after the book was written), but is written a tad too “lower class” for my taste. As for the murder itself and its solution—well, I didn’t guess it, but (as usual) that doesn’t say much. The fundamental flaw is that the first half of the book is unutterably depressing. Brade is competent but colorless. He’s been an assistant professor for eleven years and slogging along without tenure and the security it represents. His promotion to associate professor has been a possibility for at least three years but a remote one and indeed, might have been so long delayed at this point that the university might very well find it less embarrassing to dismiss him altogether than to delay it any longer. And if it does get delayed, Brade’s wife is starting to make divorce noises. As a result he’s depressed in the first half of the book. His future is anything but rosy, and the death of one of his students (to his mind an obvious murder with himself as an obvious suspect) isn’t helping. Nor are things going well at home; his relationship with his wife is strained at best and on the verge of falling apart altogether at worst. Asimov works this well into the overall story-line of the book, and Brade is able to pull himself out of his funk and start making a difference in his own life as it progresses, but it means that the book is off to an unpleasant start and that tends to color my overall impression. On the other hand, the whole experience of the sociology of a university chemistry department is a lot of fun. Having worked in a secretarial capacity at the UC Berkeley molecular biology department while a graduate student myself, I’ve seen fragments of that same world that Asimov is portraying, and it is a different world from where the rest of us live. On the whole, that end of the book is certainly pleasant enough. Bottom line, then, is a solid reasonably worthwhile book, particularly for the Asimov fan who also enjoys a good mystery or who has lived in the bizarre world of academia — but not Asimov’s best by any means.